Every autumn, after bidding farewell to our summer interns, we take some time to look back on our internship recruiting data from the past year. We’re interested in tracking our performance and evolution in terms of applicant volume and sourcing so we can make informed decisions about the upcoming recruiting season which, after all, is barely round the corner. Four years in, we’re once again looking at the numbers. Here’s what we’ve found. Takeaway: Total application volume came in at roughly the same level as last year. 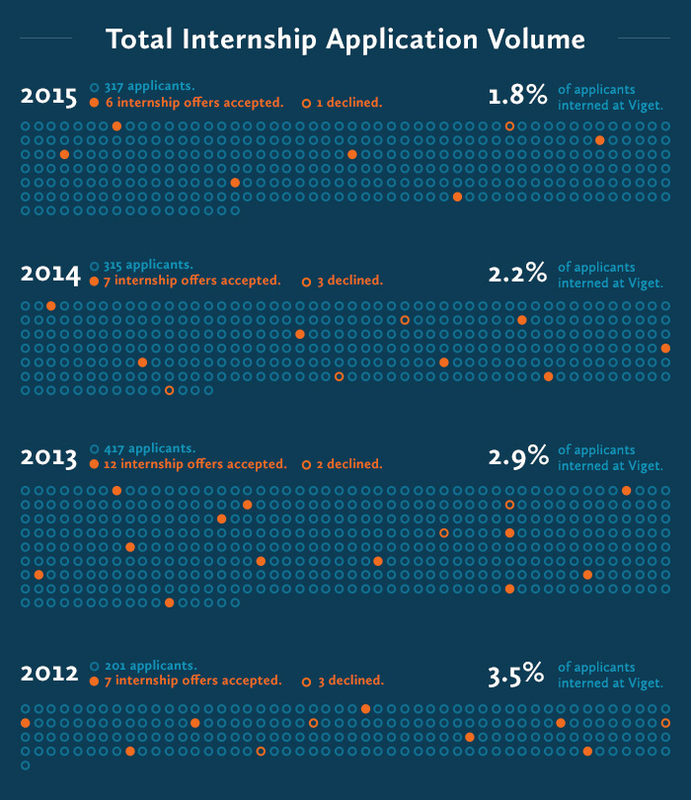 We’ve learned over the years to expect 300-400 applicants per year, and we were right in that range this time around. However, we also added an additional role this year—the Copywriter Internship—which brought in roughly 20% of our total volume. In other words, volume for our standard slate of internship roles declined by about 20%. It’s hard to know exactly why the volume decreased for these roles, especially when working with fairly small numbers (from a statistical perspective). However, it seems like one factor could have been related to how we posted our roles on InternMatch/LookSharp. We’ve always been fans of InternMatch, and we usually bring on at least one intern via InternMatch. But, this year, we opted not to pay for a full company profile on the site. Instead, we posted just the listings (as one can on any normal job board). We made this choice mainly because we’ve been able to commit more resources internally to building our internship brand on our own site, as well as to promoting more actively via our own social media channels. 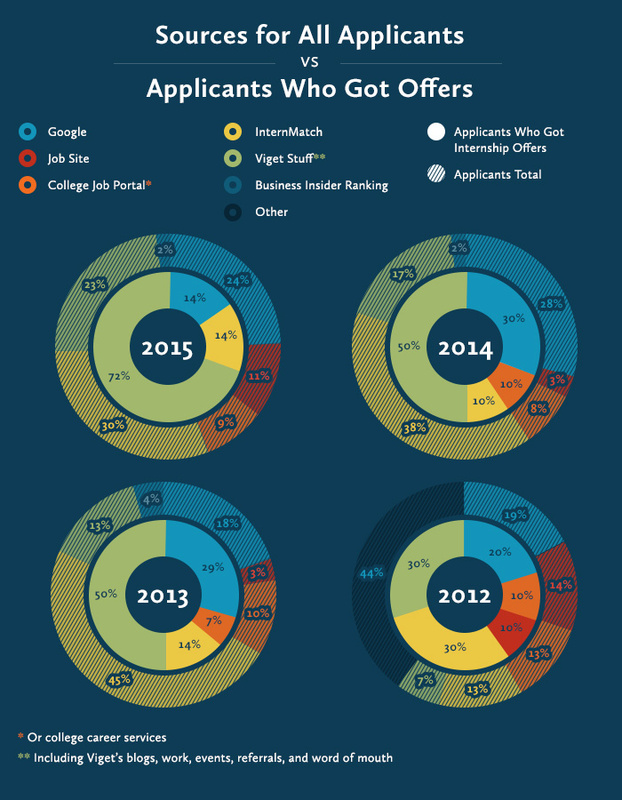 The total volume of applicants sourced via InternMatch was down 8%. But, for UX applicants in particular, the volume decreased by 58% while staying steady in all our source categories. For the CEO/Founder role, the volume sourced via InternMatch decreased by 33%. 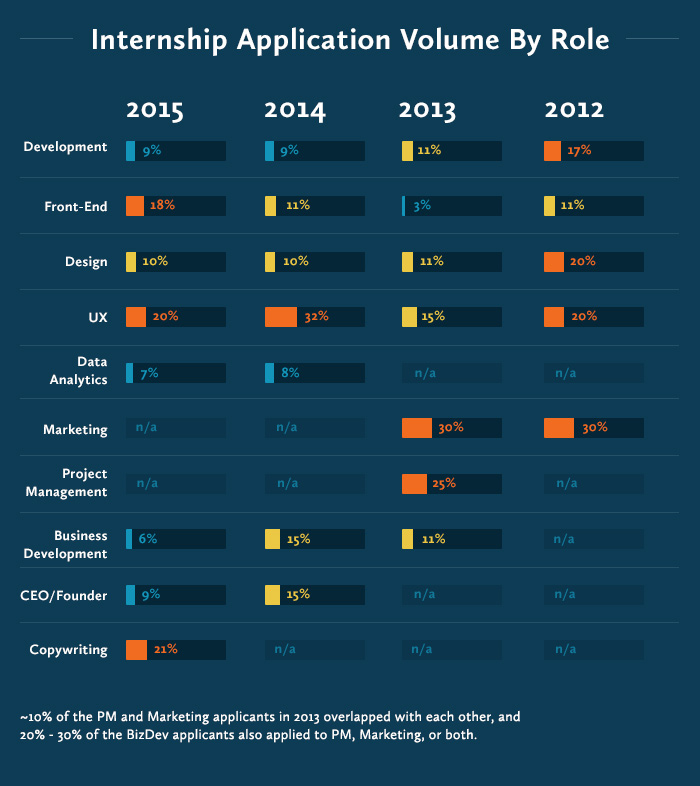 For the BizDev internship, the volume fell less dramatically but still declined by 2%. Interestingly, though, we found the quality of our applicant pool was comparable to that of past years—and, if anything, even stronger. The UX applicant pool in particular struck us as noticeably stronger this year, despite the decrease in volume. “The group reaching late evaluation stages was pretty top notch,” says UX Director, Jackson Fox, “We passed on at least one applicant who would have been a top pick in previous years.” Overall, the applicant pool yielded two UX interns and one UX Apprentice for the summer, as opposed to just one or two offers per year in the past. Additionally, although our FED Internship application volume rose from 11% to 18% of the total applicant pool—a rise from 36 to 56 applicants—we found only one or two of them to be strong enough to pass our initial quiz. However, we did make an offer for the role—the single offer that was declined this year because, unfortunately, the applicant’s scholarship requirements precluded leaving his state for a ten-week stint in Colorado. Despite the offer decline, we consider the offer successful in the sense that it was made to a repeat applicant—that is, the applicant had applied to our program the previous year. Our program’s strategy is a long-term one so, when we see repeat applicants perform successfully in our process, we know we’re doing something right. Takeaway: As in past years, the Viget Stuff category has once again grown in importance. Most of our successful internship applicants find out about us through our general work and activities: our client work, events we attend or speak at, our blog posts, and word-of-mouth leads. One new factor in the growth of this category is probably our relatively new initiative, over this past year, to foster our intern alumni network. As we send more former interns out into the industry, we’re taking more intentional steps to stay in touch with them about Viget news, encourage them to share news of our internship roles with their own growing networks, and even offer informal mentorship to current interns during the summer program itself. One critical advantage of the Viget Stuff category? For the most part, we’re doing this stuff anyway. Viget Stuff is not comprised of time-consuming efforts embarked on just for the sake of attracting internship applicants. Instead, it’s the happy side effect of having a staff that’s engaged in their work, sharing their knowledge, and learning more in the process.